One of the biggest problems of megacities like Metro Manila is garbage. To compound the woes of Metro Manila residents, the local governments do not seem to know the solution to the problem. 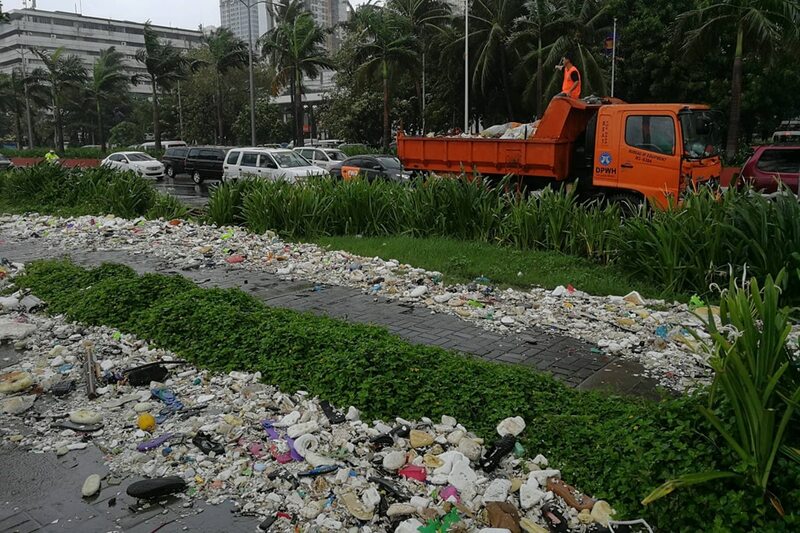 When the seasonal monsoon visits the country and in other parts of Asia, the garbage problem of Metro Manila becomes even more pronounced. Here’s the photo from ABS-CBN taken in Roxas Blvd during this year’s seasonal monsoon rain and flood. If you wonder where the hell did this garbage come from, this video circulating online will now answer our question. The raw CCTV video showing an unnamed individuals disposing their bags and bags of garbage into the running flood water was uploaded recently by the Facebook page “All about the Philippines”, eliciting angry reactions on Facebook. According to the caption of the uploader, the video was taken in Caloocan City. As of this writing, 4,000 plus people reacted ,2,000 plus commented and 15,000 shared the viral video, less than 24 hours it was published. The general sentiment on social media with regards to the video has been adverse. Surprisingly, the most notable and constructive criticism came from a foreigner who called himself the Canadian political commentator, Amir Assadollahi. Here’s what Amir has to say on the viral video. This commentary is filled with criticism and some readers may find it offensive – but I say it as it is without censorship or tact – because this is a serious problem, and if you do not think it is a problem, then you are part of the problem yourself. You can teach a monkey how to walk straight, but you can not teach some people to care for their own future. Idiots! Then they complain about diseases, floods, how dirty things are. I guess as long as it is not in their doorstep it is okay for them. There should be severe penalties for littering like in Singapore, and the media should do the public education and the schools should work toward education programs. The church and all religious organizations must talk about the moral, economic, social and environmental implication of littering. Sadly the mainstream media, the educators, the religious leaders and the senate are all sleeping. You know how they would realize how important it is not to litter – dump the garbage in front of churches, schools, news agencies and the lawmakers, teachers, news reporters and teachers houses and neighborhood – just make it look like those places are dumpsters – then you will see how upset they get and how they would start talking about it to pass strict laws on littering and recycling, and then you will see educators, religious leaders, news agencies and law makers take a serious look at this issue of littering. What I said has a pinch of a sarcasm in it, but I guess the reader gets my point, because all I see is that leadership in educating people is missing, and laws are too weak and looks like that there are n’t any regulatory system or legal system or even punishment system exist! When people have no sense of ownership and pride toward what is there for them to be cared for their own enthusiasm, and have gained an attitude that someone constantly need to tell them what to do because they cannot realize how problems is created, then they always look at themselves with a feeling of pity and envy what others have, and they are easy to be taken advantage of. That is why it was so easy to take advantage of the Filipinos in the past 30 years after EDSA, and corrupt and criminals just ruled over them just as the colonial masters once did. Once again, I hope my readers realize my tone of sarcasm. What you do is what you get, just remember that!